How do you find a balance between a moderate germaphobe and the keeping and cuddling of backyard chickens? Clean handling measures of our chickens out back is a priority for me. 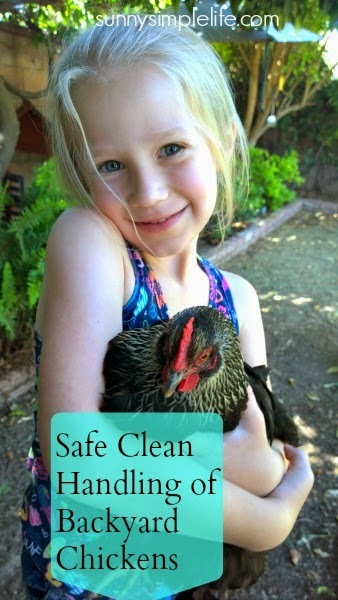 I want us to be able to hold and handle our chickens, but I also want to keep the family and especially the little one who hangs out in the coop safe from the germs chickens can carry, namely salmonella. When it comes to holding the chickens, I will often take a look at their feet, chickens will step in poo and not care, but we do. We don't want our clothes and hands to be pooey but mostly what we do is hold them then wash up well and change our clothes when we come in. Some may say I am over cautious but it is worth it to me to safe guard my little one from picking up any bad germs. We keep a jar of hand soap by the back hose for quick clean ups but also wash when we come inside the house in the bathroom sink. Keeping the coop clean is also a way to keep the poop traffic down. We have special shoes we only wear in the coop. I love sand on the coop and run floor because it helps the chicken poop to dry quickly. I use an old kitty litter scoop to pick up and remove chicken waste. I always wear gloves when doing any cleaning in the coop as well. I do not wash chicken waterers or feeders in my home either. I wash them outside and rinse with the hose. 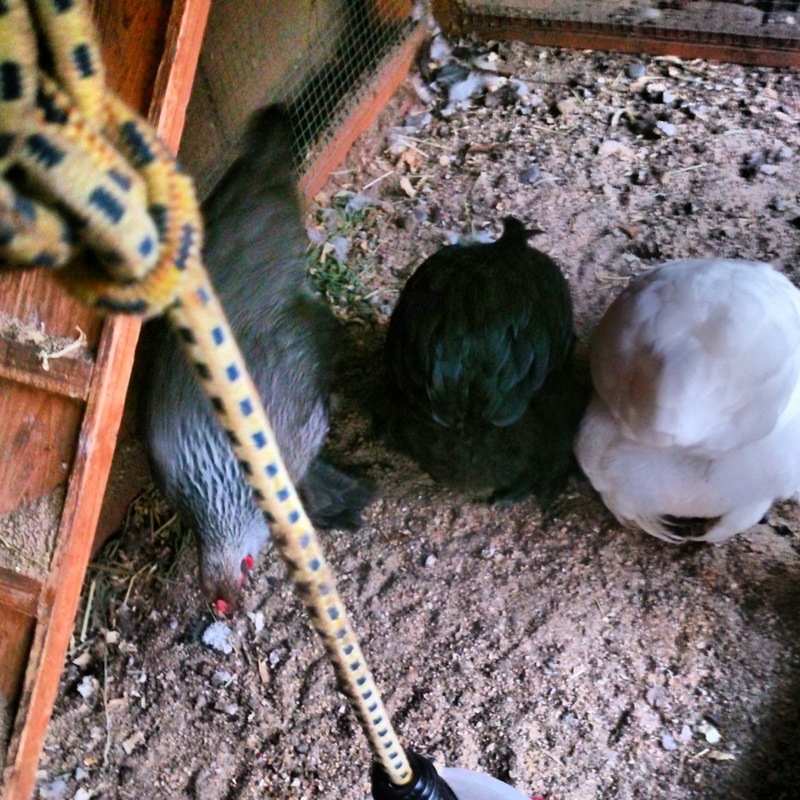 Daily, I do check and make sure the nesting boxes are clean of any chicken poop. Usually they are clean but you can get some tracked in there by your chickens. As we collect eggs, if they are clean, we do not wash them as eggs are laid with a protective coating that seals eggs but if they are soiled at all we gently wipe them off with a damp paper towel and store in the refrigerator. Having a small flock I think is easier to clean up after I am sure, and especially necessary because I have a small urban backyard for chicken keeping. These are just safety measures we practice to safely house and keep chickens in a small urban setting. Good tips Elaine. I do pretty much the same things. I think the biggest thing is to not wear shoes you wear to coop, into house. You brought up some really good points because it is so hard not to cuddle the chicks! I don't think you are overcautious at all! 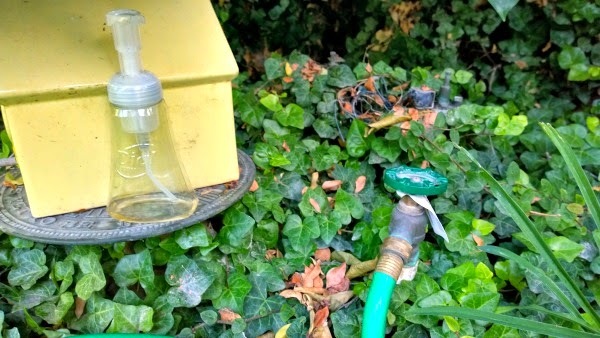 Having animals (or birds) requires an understanding that dirt and germs are part of the deal and have to be dealt with to keep from contaminating your own home and keeping the family healthy. Great article and good points Elaine! I love this post, Elaine. If we ever get chickens, these good tips will come in handy. I think it's very wise to be cautious. We are very careful how we handle meat in the kitchen and it makes total sense to be very careful to avoid bringing germs into the house as well. .. great tips Elaine.... it's always necessary to keep the cleaning and maintanence of outside animals separate from indoors. Our dog is an inside/outside pet ..he lives inside and eats inside. Hubby pooh patrols every morning and keeps an eye out through the day. That sounds like good ole' common sense to me! Thanks for sharing this valuable information!